" Guest Hosting 'Malloy Show' (Black) Friday!	" Guest Hosting 'Malloy Show' (Black) Friday! Hang on to your black Friday dollars by listening to free talk radio tonight on the peoples' airwaves(! 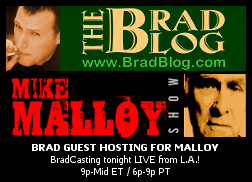 ), as I finish out the week as guest-host on nationally syndicated Mike Malloy Show. « PREVIOUS STORY "Happy Thanksgiving Day, America 2010!" "Guest Hosting 'Malloy Show' (Black) Friday!" can't seem to to make the chat come up. It keeps staying dark and I can't post. WTF? Brad, you really need to get a different chat somehow. I loved the guest hosting today. It is my first time listening and I come from a "talk radio desert [T.R.D]" where all of the talk radio goes from extreme right to extreme right and nothing in between. There are literally no radio stations that broadcast any form of progressive or liberal talk so I am purely an internet radio listener, the internet allowing me to escape the "T.R.D". It is incredible, like water to thirst, finding this community and the Malloy show on KPTK led me here. It is extremely refreshing to know that there is a place where truth is appreciated, used and spoken on a regular basis. The truth often hurts but not as bad as the lies. I methodically listen to all sides but using the term "all sides" is a stretch when there is a scarce amount of progressive media to balance the amount of conservative. Thank you for giving me something positive to listen to. “Beware of the leaven of the Pharisees, which is hypocrisy. For there is nothing covered that will not be revealed, nor hidden that will not be known. Therefore whatever you have spoken in the dark will be heard in the light, and what you have spoken in the ear in inner rooms will be proclaimed on the housetops." I assume you're talking about the Wikileaks....? Just wanted some clarification. Scripture confuses me. I am beginning to look at the WikiLeaks with caution. Are we being manipulated into war with Iran? Who benefits? Are we pawns in a giant game of chess..or perhaps 'game theory warfare'? I highly recommend Sibel Edmond's interview with American journalist (and practicing Jew) Phillip Weiss. Whether it be Christian, Jew, or Muslim, the moderate/progressive voices are censored..even in the so called "left" media. "Peter Phillips describes Project Censored, its mission, operational style and funding, then talks about what he has coined as ‘Truth Emergency,’ and provides examples such as the intentional misreporting of the number of civilian deaths in the Iraq war, and government insider media groups such as the Rendon Group. Mr. Phillips talks about the findings of his project’s studies and research of some of the more visible left-leaning alternative media with propaganda patterns similar to the mainstream outlets, especially on issues such as Israel, 9/11, and elections, and discusses the notions of objectivity, partisanship, and conspiracy when it comes to the media today, and more!" "In the WikiLeaked cables, the Israeli government constantly highlights three threats: “Iran's nuclear program, the build-up of rockets and missiles in Lebanon, Syria and Gaza, and the Goldstone Report.” (#09TELAVIV2777) In defense against each of these threats, and in other arenas, the Israelis seem adept at coercing the US into doing their bidding."